The 2008 Olympic Games in Beijing start next Friday—08.08.08—and Volkswagen is looming as having as much presence around the Chinese capital as any of the athletes. 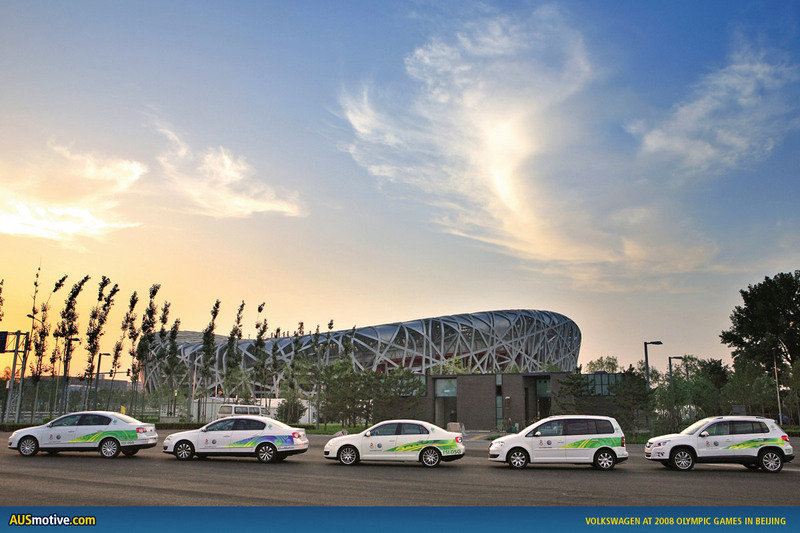 A total of 5,000 vehicles have been assigned by Volkswagen Group China to aid logistic support during the Games, moving around athletes, Olympic guests and media. The vehicles assigned to the press center have been labelled the “Green Fleet” on account of their low emissions and low fuel consumption. The pavilion will feature models from Volkswagen, Audi and Skoda. More images and Volkwagen’s full press release can be seen below. Wolfsburg, July 31st 2008 – The Volkswagen Showcase on the “Olympic Green” is now ready to welcome guests to the 2008 Olympic Games in Beijing. As the exclusive Automobile Partner of the Beijing Organizing Committee of the 2008 Olympic Games (BOCOG) and national sponsor, Volkswagen Group China has already handed over 5,000 vehicles, all complying with the Euro IV emissions standard, as logistic support for athletes, the media and Olympic guests. Furthermore, Volkswagen is providing a fleet of very low-emission, low-consumption vehicles christened the “Green Fleet” to the BOCOG’s Main Press Center. Complementing the vehicle fleet, the Volkswagen Showcase is the second main pillar of Volkswagen’s Olympic commitment. “The pavilion gives our guests to the Olympic Games the opportunity to experience the Volkswagen Group and its brands in the unique environment of the world’s biggest sporting event,” Lutz Kothe, Head of Sponsoring & Events at Volkswagen AG, commented. 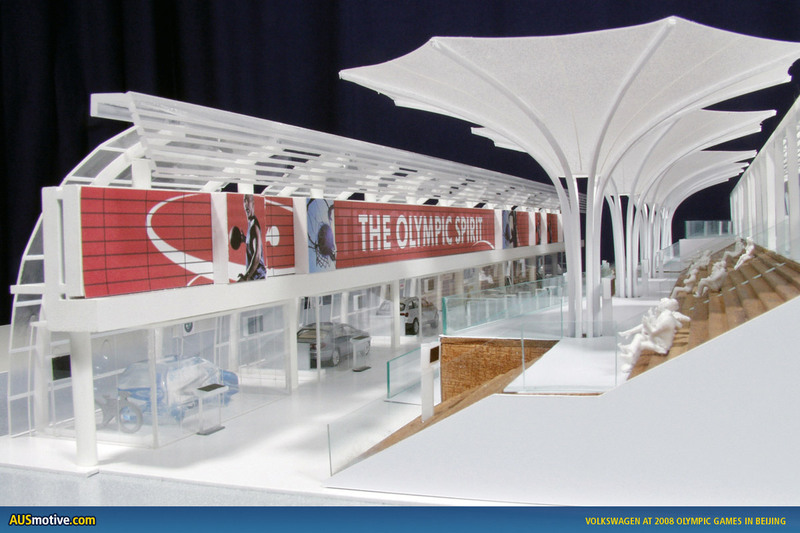 The company expects to welcome four million guests, or around 160,000 visitors per day, to the Volkswagen pavilion at the Olympic Games. The design of the pavilion features three interlinked themes: the automobile, the Olympic Games and the host country China. The exhibition center and meeting place is housed in a two-storey building which also contains service rooms and two lounges. Under the Volkswagen Group’s motto of “Driving Ideas,” the future vision of sustainable mobility is presented in a transparent showcase. A fuel pump nozzle made of straw symbolizes the Group’s strategy to support second-generation “Sunfuel” biofuels. A second, real-life, nozzle represents present-day fossil fuel supplies. The yin and yang symbols reflect the host country’s traditional culture as well as symbolizing a solution combining both technologies. Union racing car, while the Octavia represents Skoda’s present model range and the Audi R8 TDI Le Mans embodies the trendsetter of tomorrow. The pavilion also features a 70-meter long, 3-meter tall high-tech media banner with nine mobile LED panels bringing guests the “Olympic Loop” designed by Volkswagen. 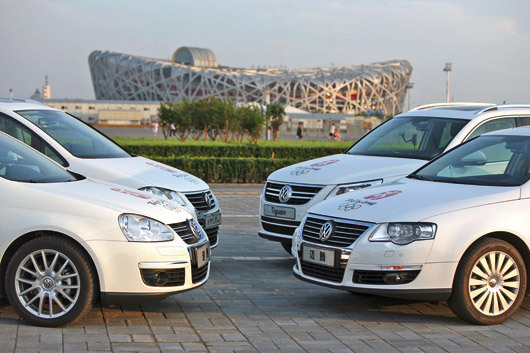 Seven different thematic sections make the connection between China, the Olympics and the Volkswagen Group and its brands. A newscrawler brings visitors the latest competition results. The banner also serves as the moving background to a live performance by high- wire acrobats taking place up to ten times each day. 190 exhibition stand builders used approximately 500 metric tons of steel and around 1,600 m³ of concrete to build an area measuring approximately 2,700 m², 2,000 m² of which is taken up by the pavilion alone. Some of the materials were produced locally in China. Some 890 packages weighing 256 metric tons each were shipped by air and sea to China from Germany. “We are very proud of the Volkswagen Olympia Showcase, which will be our home base over the next few weeks. Together with our guests and the athletes, we are looking forward to the 2008 Olympic Games in Beijing,” Kothe added.